There’s something special about having the right pair of pants on. We all do it; even though we have a closet full of men’s pants to choose from, we gravitate towards a pair or two because they have the best fit and form. The best dress pants for men are those that allow freedom of movement while cutting a sleek and good looking figure. How, then, can you transform your closet so that every single pair of pants is one of your favorite pairs? You simply need to invest in some of the top options for men’s dress pants. Today, we’ll introduce our list of the top five pairs of men’s dress pants. This list will enable you to revolutionize what you wear. By the end of today’s article, you should be able to find the perfect pair of pants for your needs! In putting together this best list, we’ve focused on a few features that are essential in great dress pants: flap style, cuff details, fit, material, durability, pockets, lining, and more! There’s a lot to consider to ensure that you get the best value pants possible, and we wanted to be sure that we covered it all. During our introduction of the top five dress pants of 2019, we’ll cover some of these features on each pant so that you can get a full picture of which pants you like best. First up, we’re going to cover a pair of dress pants from the very popular brand Lee. The Lee Total Freedom Men’s Classic Fit Pants is a modern take on a very classic fitting pant, but what do these specific pants have to offer over a basic pair of dress pants? We’ll start by talking about the fit of these pants, which is known as a relaxed, classic fit. While the width of the waist and hips on these pants is standard, the legs are very relaxed. This means that there is a generously sized opening around the legs, so you have a lot of freedom to move around and will not feel constricted by the tightness of the pants. Rather than having a pleat at the front, these pants have a more modern flat front style. A flat front style is best for those with slim-to-medium builds, but it can flatter any body type if sized properly. Another bonus of these specific pants is that they are from a reliable and well-loved brand. Lee has been making quality pants for a long time, and you can expect the pants to bring along some of that reputation with them. These pants are available in six different colors and a wide variety of sizes to accommodate different shapes in the same style. The pants themselves are machine washable as they are made from a 75% polyester, 25% cotton blend. That kind of blend is relatively stain-resistant as the polyester prevents them from sucking in or holding onto stains that can happen during any normal wear-and-tear. They also will not need to be ironed as frequently. With multiple colors and sizes to choose from, you can get a pair of pants that will suit your style and taste. These pants are designed to help you move around with comfort. The next dress pants that we are covering today are the Perry Ellis Men’s Portfolio Modern-Fit Performance Pant. This is another modern take on classic style men’s pants, and we feel that Perry Ellis has brought a lot of unique touches to these that you may find to be interesting. Before we get into the specific styling details of these pants, let’s talk about the colors and sizes. 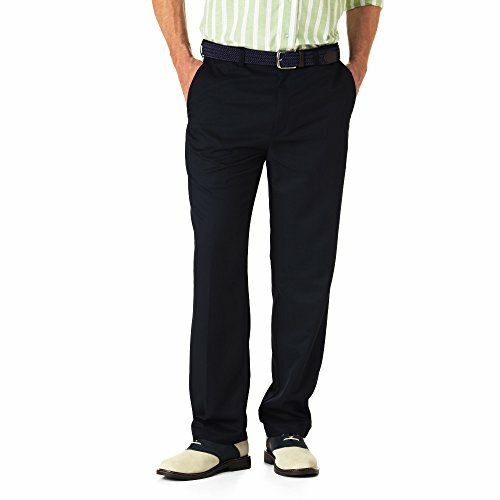 These pants are available in 11 colors that take on the classic needs for more men: blues, blacks, greys, and khakis. The sizes available cover a good variety of widths and lengths as well, so you should be able to find your size. Now, let’s talk about how these modern-fit dress pants are cut. First, they have flat front panels. This is standard in modern-style dress pants these days, so you have no pleats at the front. Additionally, the waistline sits a bit below the waist instead of right at it which is another modern style choice. The legs on these pants are straight tailored legs. The fit is straight not only through both the seat and the thighs, but the straight fit continues through the leg opening as well. As these pants are 100% polyester and have a fair bit of stretch to them, the fit and material allow for great flexibility while you wear them. Another benefit of the pants being 100% polyester is that they’ll seldom require ironing as they won’t take on wrinkles like some cotton or poly-blend pants might. The material is also completely machine washable. Additionally, they feature fashionable slanted side pockets and button-through welted back pockets. With sizes and colors available for every preference, these pants look modern with stylish pockets. They’re easy to maintain and should last you a long time. Now, we’ll examine the Haggar Men’s Expandable Waist Pants. Haggar has been making different styles of dress pants for several decades now. Many men have come to love their sizes and fits. As times have changed, Haggar has also continued to update their styles to match current trends. Their style Cool 18 is a 100% polyester blend of pants that are designed for a performance fit. This means that while they can look sleek, clean, and professional for your next meeting, they’re also good to wear when you need to be doing a good amount of movement while still looking very professional. As these pants are 100% polyester, they will not usually require ironing. They can be machine washed without fear of the pants shrinking so taking care of them will be relatively easy. These pants are designed with the Haggar classic fit. With the flat front, this fit sits just below the natural waistline and has a straight seat down through the thighs and legs. The pockets are side-slanted, and the pants are available in 13 different colors. The real standout feature of these pants is their expandable waist. With this design, the waistband can stretch up to three additional inches, so you’ll be comfortable even if you twist and turn in the pants. In addition to adding extra stretch in the waist, this expandable design also gives a little bit more room in the hips and seat that can also add to your comfort. Some have found, though, that the inseam does not take the need for some extra girth into consideration. Whether you have a medium or large body built, this pair of pants could be perfect for you. With its expandable waist, you can move around without compromising style and comfort. Our next pair of pants is from a brand that has been continually growing in popularity for the last few years: Reaction by Kenneth Cole. The Reaction Kenneth Cole Straight Fit Men’s Stretch modern-style pair of pants with a straight leg design that many will love. Like many of the pants that we have introduced today, these functional dress pants are made from a 100% polyester fabric material. Unlike the other dress pants, though, these are made from a stretch gabardine fabric, a woven fabric that is midweight and very strong. The weave and additional fabric treatments provide both stretch and durability. Still, these pants can be washed at home in your washing machine and cared for very easily. While the fabric is treated to stretch, they will not stretch out too much, and the stretch will only occur in areas where you really need it. Should any wrinkles appear on these pants that are mostly wrinkle-resistant, it is very easy to remove them using a steam iron. Additionally, these pants are known for being relatively lint-free even when purchased in black. There is no front pleat on these modern-style pants. Instead, they have a more updated and common flat front design. The pockets are on the side seams which are less common in modern fit pants but desired by many. The pockets at the back of the pants are shell-style buttons, and the pants have belt loops. These pants have a sleek and modern fit, as well as side pockets that have been placed intelligently to add more style. They are easy to maintain, durable, and stretchable. The final pair of dress pants that we are going to introduce to you today is the Van Heusen Men’s Flex Straight Fit Flat Front Pants. As with many of the dress pants that we’ve introduced here, these pants have a flex-fit style. Van Heusen is a very popular brand of men’s dress wear. While many people know them for their shirts and ties, they also have hugely popular lines of pants like these flex pants that many people love. For that reason, men often look to this brand for their durability. First, let’s talk about the material of these pants. They are a blend of 72% Polyester, 22% Rayon, and 6% Spandex. This blend has a few benefits. First, it is machine washable, so you can take care of these pants at home. All you need to do is wash, dry, and then go. Second, it is relatively stretchy because of the poly-blend and the included spandex. Rather than fighting against you, these pants will move with your body. For an additional stretch, the waistband has a slight extension panel. You can stretch these pants up to an extra 1.5” thanks to some added elastic sections. This makes the flex pants ready to keep you comfortable through the day. The fit of this pair of pants is classic. 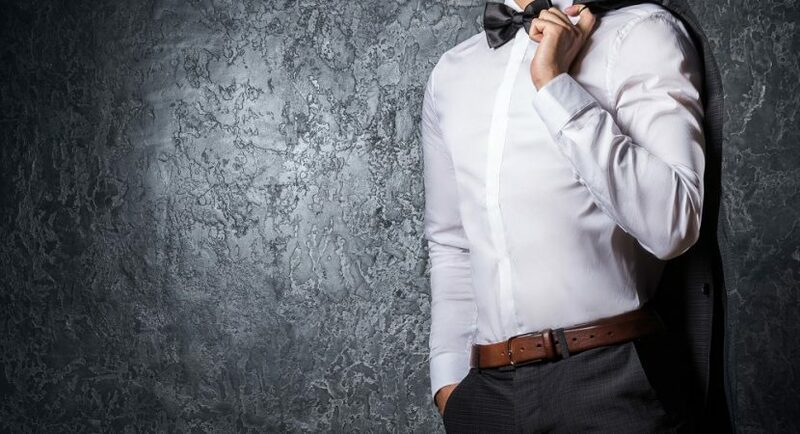 The waist, thighs, and leg openings are all straight, leading to the sophisticated and classic look that many people are hoping to get from their dress pants. There is no front pleat on the pants; they are a modern flat front design style of pants. With these flex pants, you can do both office and field work with ease while looking professional the whole time. Now that you’ve seen all of our options for the best dress pants of 2019, let’s get down to what everyone really wants to know: which pair of pants is the ultimate winner? In our opinion, Lee Men’s Total Freedom Classic Fit Pant is a fantastic choice for most men. This pair of pants balances price with quality and comfort in a great way. While you do have to be careful about how you care for these dress pants, the same goes for most pants! If you prefer to get performance dress pants that don’t require careful laundering, you may find that the Van Heusen Men’s Flex Straight Fit Flat Front Pant is a better choice. These pants are made out of a poly-blend material that can be cleaned and maintained more easily than some other dress pants. Today, we’ve introduced five different pairs of dress pants. 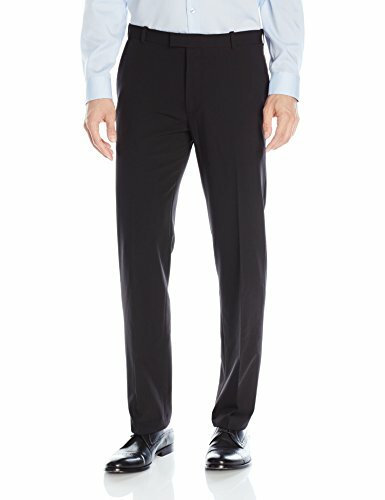 While most of these pants are a modern take on the classic fit of dress pants, they each have unique features. Hopefully, the features reviewed for these pants have helped you to find a perfect pair of pants that will help you shine at work or in your next professional setting!